One thing you can count on with Texas is that they’ll do a great job with fireworks. Last night after the Red Sox beat up on the Astros, we stuck around after the game for the fireworks show. It’s pretty freaky seeing a ballpark turn into a convertible as the roof retracts! 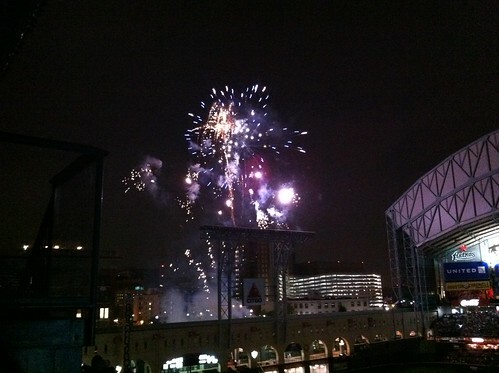 My iPhone camera couldn’t do justice in snapping a few photos of the fireworks over Minute Maid Park. I’ve tried taking pictures of fireworks, and I always just miss the moment!